The past 7 months has been a busy time for me. Starting a new job, moving to a new place, and of course school. It was a stressful time for me to say the least. Unfortunately, within those 7 months I really let go of my healthy eating habits and started to eat a lot of processed foods. It’s hard to plan and cook meals when you’re so busy with other things and I probably had a lot more instant ramen noodles and Korean Chocopies than I’d like to admit. However, it’s no excuse for poor eating habits since I know a lot of people manage to eat healthy while leading busy lives. Hopefully getting back into the blog will help me with getting back on track! For this post I decided to health-ify strawberry shortcake, a common dessert that’s full of fat, processed sugar, and gluten. My version, however, has none of these things. 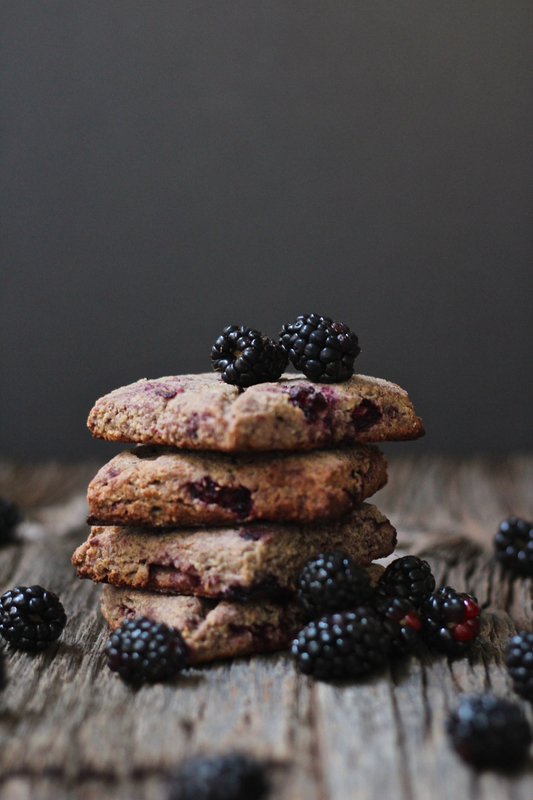 The biscuits are gluten free, sugar free, and sweetened with apples and blackberries. While the whipped cream is replaced with greek yoghurt and out of season strawberries are improved with a little vanilla and maple syrup. It’s delicious, in it’s own healthy way, without making you feel guilty and without making you feel like you need to take a nap. Combine dry ingredients in a large bowl. Add in coconut oil and using 2 knives or a pastry cutter, cut in the oil until it is evenly distributed in small pieces. Add in the rest of the ingredients except blackberries and bring into a dough. If too sticky add more flour and if too dry add more milk. Gently fold in the blackberries. Lightly dust your work surface with buckwheat flour and pat out evenly to about an inch thick. Cut into squares with a knife or whatever shape you like. Lightly score the top of the biscuits from corner to corner. Bake on a parchment lined sheet for about 15 to 20 minutes, or until the bottom is browned and crisp and the inside is slightly moist. In a small saucepan, cook strawberries and syrup on medium low heat until thick and bubbling, about 20 minutes. Add vanilla and lemon juice. 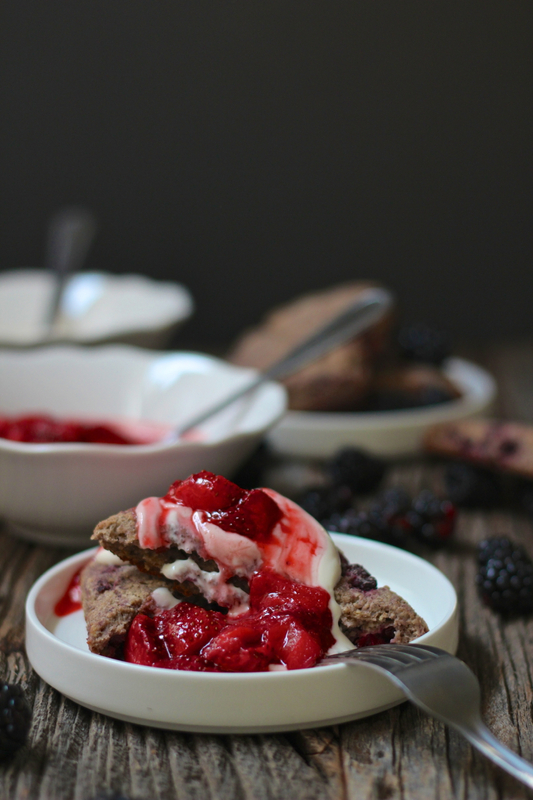 To assemble the shortcake, break biscuits into triangles and layer with cream and compote. 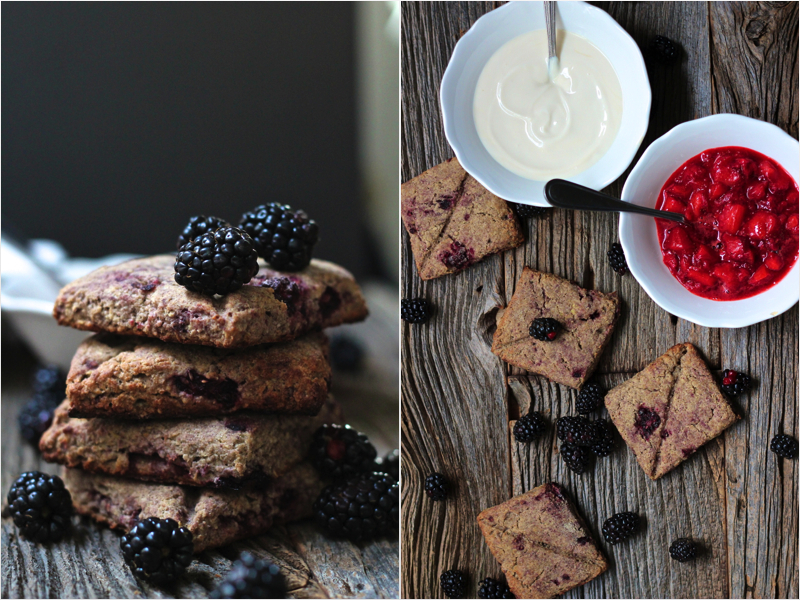 The biscuits are best served warm with the cold cream and warm compote. It’s day … of my elimination diet. Ok, so I’m not on my elimination diet anymore. Yeah, I gave up. But I did stay on it for 30 days. No cheating or anything…except for that one time on day 25 when I shoved two donuts into my mouth and then ended up eating hot sauce and instant noodles. Yeah, that happened. Though, from what I noticed, there was no change in my problem on the diet and there was no change when I stopped the diet. So maybe I don’t have any food allergies at all. Wouldn’t that be great! I was mostly scared that I would end up being allergic to gluten and never be able to sink my teeth into a fresh baked loaf of bread ever again. Saddest thought ever. Anyway, I’ve been absent on here for a while due to exams and such and now that they’re over I’m going to bake EVERYTHING. Seriously. You don’t understand how much I think about bread and buns and rolls and all things that include flour. Apparently, according to the internet, what you crave the most is often what your body is sensitive to and that could indicate an allergy to that certain food. However, I’m just going to choose to ignore what the internet says. Anyway, today’s post actually has zero to do with bread but involves a sweet little drink I came up with when I was on my elimination diet. It’s super healthy, a little creamy, a little tart, and a lot delicious. You can use already made almond milk but I didn’t have any and found the almond butter to be a pretty good substitute. As well, most of the almond milks out there tend to use carrageenan as a thickener. There’s been quite a bit of speculation surrounding carrageenan as a cause of IBS and digestive problems. I’m pretty sure I already have enough digestive problems with the amount of gluten and sugar that enters my body. 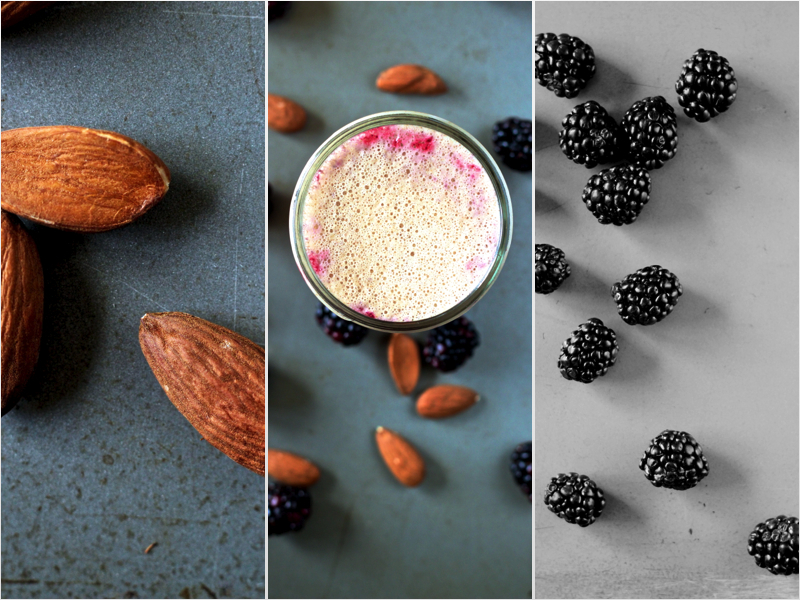 So, this drink is a combo of fresh blackberries mashed with a little lemon juice and homemade almond milk. The blackberries get layered at the bottom for a pretty colour effect and are lightly mashed for an interesting texture. It oddly reminded me of bubble tea. But much much healthier. I recommend getting your hands on some large bubble tea straws, which you can usually pick up at any asian grocery store. Next time I make it, I plan on adding a banana to the almond milk to make it more of a smoothie texture. Mash the blackberries and lemon juice with the back of a fork until liquid-y but still chunky. Divide into the bottom of two glasses. 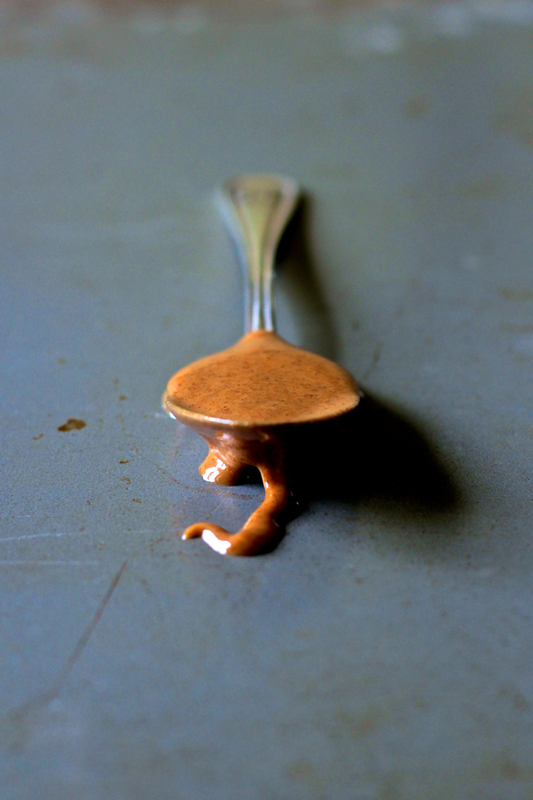 In a blender, puree the almond butter, water, ice, syrup, and salt until smooth and frothy. Add more syrup if you’d like it sweeter. 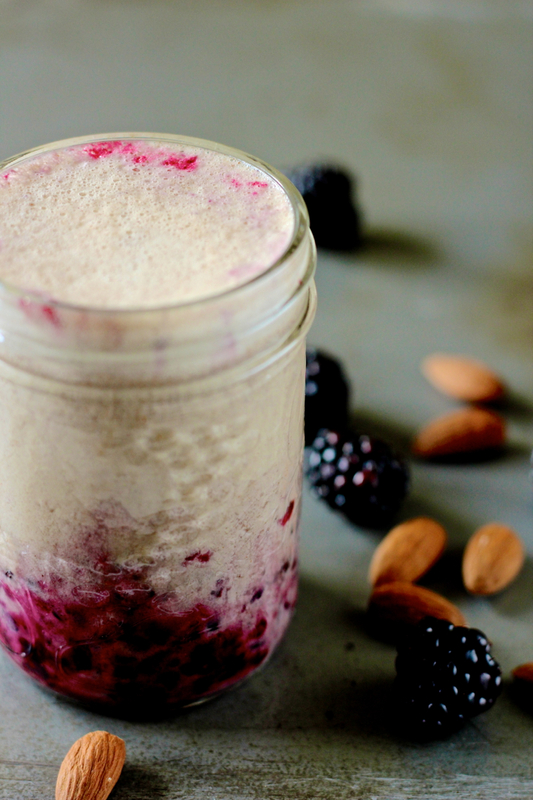 Pour the almond milk on top of the blackberry mash and serve immediately with a large bubble tea straw.